The creative agency business that insists on the traditional way of sourcing for work could be in peril. Not because of the worsening global economy, although that is one reason, but because of one little company based in Chicago called crowdSPRING. You see, the current old-school business solicitation by creative agencies involves pitching by agency suits to brand marketers and other decision makers in the hopes of landing some outsourced creative work. A company puts out a tender – which could be open to all agencies, or a closed one involving a few selected ones – and this launches an entire pitching process which could take many rounds and months before an agency is finally selected. That’s where crowdSPRING comes in. Founded by Ross Kimbarovsky and Mike Samson, crowdSPRING was started to help people from around the world access creative talent, and to help creatives from across the globe find new customers. Ross and Mike spotted an opportunity in the market – why not let the buyer specify what they want, name their own price, and decide the length of their project? And instead of sifting through bids and proposals and choosing a designer based off of that, why can’t buyers choose from actual designs that are created to meet their specifications? So crowdSPRING created a platform where a buyer can put out an open project where creative agencies all over the world can submit actual designs for the buyer to choose from. Along with tools for payment, intellectual property protection, project management, communication, and file handling services, it’s ideal for business matchmaking. The numbers prove it. Since its launch in May 2008, crowdSPRING has hit the $1 million mark in total awards escrowed, attracted some 200,000 entries from 18,000 creatives from more than 140 countries on some 3,000 projects to date. Think of it – that’s 70 entries per project, which a buyer can choose from completed designs within a stated budget and time period. In the traditional process, a buyer would be hard-pressed to find the time to sit down for more than 5 different pitches. “By providing a level playing field for creatives, where success is based solely on talent and not resume, experience, education, or fancy offices, crowdSPRING has opened incredible opportunities to creatives around the world who previously had few opportunities to compete in the traditional creative industries,” says Ukraine-born Kimbarovsky. Ross and Mike have known one another for 20 years. The seed of the idea was formed over a series of lunches in the summer of 2006. Mike was working on outsourcing portions of the video post-production workflow and Ross had just led a website redesign for his law firm – with unspectacular results from a top vendor. 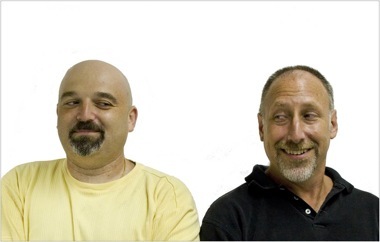 Noticing a new trend on the Internet involving crowdsourcing, Ross called Mike and said “we should talk”. 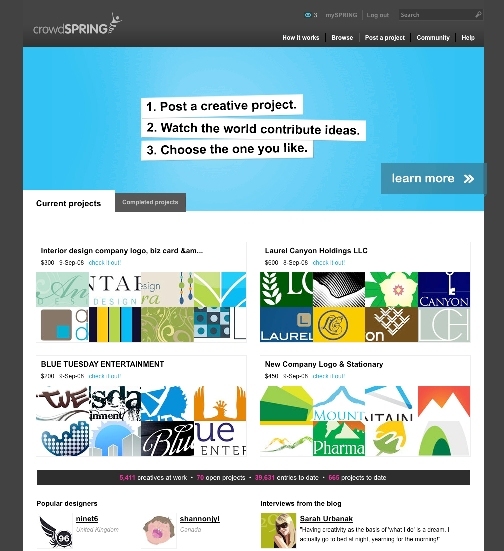 Lots of research, homework, US$3 million in angel investment and iterative steps later, crowdSPRING was born. Today, almost three years later, the team has grown to nine people. A measure of success, aside from the growing crowdSPRING community, was garnering respect and credibility from the industry. Samson was selected to represent crowdSPRING and the cause for crowdsourcing by sitting on a panel at this year’s South by Southwest Interactive Festival called “Is Spec Work Evil – The Online Creative Community Speaks”. He was joined by some of the most respected names in the design world including David Carson, Jeff Howe of WIRED magazine, Jeffrey Kalmikoff of skinnyCorp/Threadless and Forrester‘s Jeremiah Owyang. But the team is not about to let success get to their heads. “With every accomplishment that comes our way, we still face challenges just like any other small business. We are a small company, still in our infancy and one of our biggest challenges is managing our own capacity. Outsourcing and crowdsourcing lets us remain a small company by leveraging our community and others to help us succeed”.